When Jonathan was one, I tried to have a monthly Bible story we learned about. Last November, we focused on the story of baby Moses from Exodus 1 and 2. This week, we repeated a lot of the same activities that we did back then. We read the stories from Jonathan's Bible. The narrative of Baby Moses was covered in three mini-stories and the burning bush in one story. Jonathan remembered a little bit about Baby Moses, much to my delight! We also just received this early reader through Paperback Swap. It's part of the series of books that Jonathan just loves and requests each night. 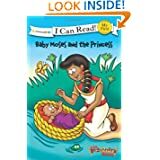 It tells the basic story of how the Pharaoh's daughter rescued baby Moses. I like that this book series is very God-centered, but leaves out some of the more mature details. We read this story three or four times and Jonathan seemed to enjoy it. However, it's not his favorite of the series. He tends to like the action stories! To make this, we used construction paper, leaf stickers, tissue paper, and our dot markers. Jonathan is all about using glue and stickers, so this craft was right up his alley. I cut grass out of green construction paper and Jonathan glued it onto the blue background. Then I cut a trunk and branches from brown paper and he glued that on as well. We took leaf stickers and stuck the leaves to the bush. Next we took red, orange, and yellow tissue paper and Jonathan tore them into pieces. We glued the pieces on the tree. Then we used our red dot marker to dot the tissue paper to make it look a little more like the bush was "burning" (instead of just a fall scene!). Jonathan was very excited to show off his art work to daddy and could tell daddy all about the burning bush! So that's what we did for the stories of Baby Moses as well as the Burning Bush! I love projects like this. They're so much fun. Love this one, too! Great job! !